Samsung impressed consumers across the globe earlier this week with its first foldable smartphone, the Galaxy Fold. But come this Sunday, the $1,980 offering could gain its first competitor. 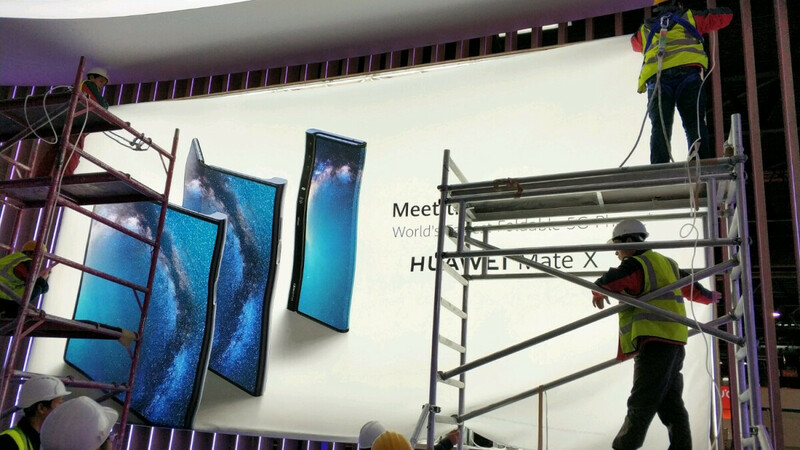 Set to be called the Huawei Mate X, the upcoming foldable device has been spotted on a huge poster in Barcelona that is being displayed ahead of MWC. On it, Huawei encourages people to “meet” the world’s “fastest foldable 5G phone.” At the moment, very little is known about this offering internally. However, today's images do reveal quite a bit about the exterior. Now, unlike the Samsung Galaxy Fold, the Huawei Mate X features just one display that can be folded in half. This allows it to be used like any other regular smartphone, albeit one with a curved edge on the left and a screen on the back. If you prefer to take advantage of the entire screen real estate, unfolding the device grants access to a tablet-like experience with minimal bezels and no notch. The rear of the Mate X isn’t visible on the poster but it does appear to include a slightly thicker area along the right side. Fortunately, this aligns perfectly with the display when folded. This added area of thickness on the back is also home to the rear cameras. In this case, a triple-camera setup that will presumably match that of the Huawei Mate 20 Pro. This should allow for some impressive photos in both well-lit and low-light situations. Huawei has previously stated that its first foldable smartphone will be released this summer. Pricing, on the other hand, is still unconfirmed. But considering Huawei’s goal of overtaking Samsung by the end of 2019, the Mate X will probably undercut the latter's offering by a decent margin. Ugly, no real pls :D look on Energizer Power Max P8100S This is good foldable no Samsung no Huawei but only Energizer. That still a rumor, and it's still far from announcement date. The actual phone probably won't look like that. And that hinge looks similar with flexpai's hinge (but turn the other way around), which looks flimsy. Well this looks really cool and also makes lot more sense. Most interesting part about this tech is this that we will see many different designs. How does it make more sense when the screen folds outwards? The sides are basically screen, that must affect it's durability. But I get it, you would jump on every bandwagon just to take a swipe at Samsung, your life must be so sad to burn all this energy into hating a piece of electronics. You only have one screen and when you use it folded or unfolded you have good size screen. Based on the photo this also looks lot less bulky. But we will find out more sunday. Overall it looks lot better and it has nothing to do with who did it. I think majority will agree with me that this is lot better way to do it. Why you makes this about me? I'm sure others see it too. Based on practically alone, this is a bad idea. Even placing your phone on a table will be an issue now, and from my experience with Huawei phones, especially the Mate 20 Pro, the glass they use is a scratch magnet. Check XDA for more about this. And no, you're not fooling anyone, you were the 1st to comment on almost every S10, Galaxy Watch, Galaxy Fold articles 2 days ago, saving no energy in attacking them. Your history speaks louder than your denials. LIAR! I haven't even opened galaxy watch articles. And i commented almost all S10 articles? Wow, i wrote to one of them today. I'm now starting to understand you better ;) Looks like your hating makes you imagine things. "Even placing your phone on a table will be an issue now" What if the frame is just a little bit over the screen and the screen never touch a table? It will be certainly more fragile, but from usability perspective it makes a lot of sense as you don't have to flip the device to turn it into tablet form. I wouldn't consider buying any foldable tablets as long as they keep using bendable plastic for the screen protection though, plastic can be easily scratched and gets scuffed up very quickly. Huawei is going for the jugular! This is a much better implementation of the foldable phone. Take notes, Samsung. My favorite part is how it’ll most def not get destroyed when laid on a table due to hairline stratches from it not being protected. If Motorola does release the concept razr phone we saw last month, imo, that would be the best implementation of a foldable phone. Exactly! That's what I envisioned when I thought of a foldable phone, not this " let's turn it into a tablet" crap. Personally I think it's a bad desi with w teen folding on the outside. Samsung fold on the inside it better. What about the back of the phone. Since the screen is on the outside,okay. Image all the scratches and dents. Also want can of screen protector you have to use, has Huawei made a flexible one. Anyhow, will wait and see. Screen exposed to fingers is a bad and impractical design for smartphones. It might look nicer but practically not going to withstand wear and tear, even if they include something like a rubber bump like what we see on some laptops. I understand differences will make people distinguish which is Samsung and which is Huawei, I think that Samsung stayed with their concept design years ago, so for me I recognize it is Samsung. And this, is Huawei. Is saying " world's FASTEST foldable 5G phone"
Huawei is desperate to get the first place in mobile division, but forgets that Samsung is the Usain Bolt. I've been a Huawei user for over 4 years but i prefer Samsungs implementation of the fold. Plastic screen on the outside of the phone makes zero sense to me, while it looks nice but it's just not practical and even if it has raised edges for when it's on a flat surface it wont stop the phone getting scratched to hell when it's coming in and out of your pocket. Yeah, it looks slicker and more "futuristic" than Samsung's Fold, but seems a lot less practical. Having the screen fold outward means it will be far more vulnerable to scratches, dents and cracks. Best implementation so far in my opinion. Does two things better than Samsung, a big frontscreen so it will be more usable when folded and the design seems alot slimmer as well.